Instead of looking for water as a sign of life on distant exoplanets, scientists should instead look at an exoplanet’s ionosphere, the thin uppermost layer of atmosphere. For decades, astronomers have been searching these distant exoplanets for signs of life, mostly looking for that most essential molecule, water. But Michael Mendillo and his colleagues have a different idea: search for an ionosphere like our own planet’s. Find an ionosphere like Earth’s, they say, packed with single oxygen ions, and you have found life. Or, at least, life as we know it. On January 9, 1992, astronomers announced a momentous discovery: two planets orbiting a pulsar 2,300 light years from our sun. The two planets, later named Poltergeist and Draugr, were the first confirmed “exoplanets”—worlds outside our solar system, circling a distant star. Their work began when Mendillo and associate astronomy professor Paul Withers received a grant from the National Science Foundation to compare all planetary ionospheres in the solar system. (All the planets have them except Mercury, which is so close to the sun that its atmosphere is stripped off entirely.) Simultaneously, the team was also working with NASA’s MAVEN mission, trying to understand how the molecules that made up Mars’ ionosphere had escaped that planet. Since the early years of the Space Age, scientists have known that planetary ionospheres differ greatly, and the research team started to focus on why that was the case, and why Earth’s was so different. While other planets stuff their ionospheres full of complicated charged molecules arising from carbon dioxide or hydrogen, Earth keeps it simple, with mostly oxygen filling the space. And it’s a specific type of oxygen—single atoms with a positive charge. “I started thinking, how come our ionosphere is different than the other six?” recalls Mendillo. The team ticked off numerous possibilities for Earth’s high concentration of O+ before settling on a culprit: green plants and algae. Most planets in our solar system have some oxygen in their lower atmospheres, but Earth has much more, about 21 percent. This is because so many organisms have been busy turning light, water, and carbon dioxide into sugar and oxygen—the process called photosynthesis—for the past 3.8 billion years. On Earth today, excess oxygen molecules, in the form of O2, float upward. When the O2 gets about 150 kilometers above the Earth’s surface, ultraviolet light splits it in two. The single oxygen atoms float higher, into the ionosphere, where more ultraviolet light and x-rays from the sun rip electrons from their outer shells, leaving charged oxygen zipping through the air. The abundance of O2 near the Earth’s surface—so different than the other planets—leads to an abundance of O+ high in the sky. 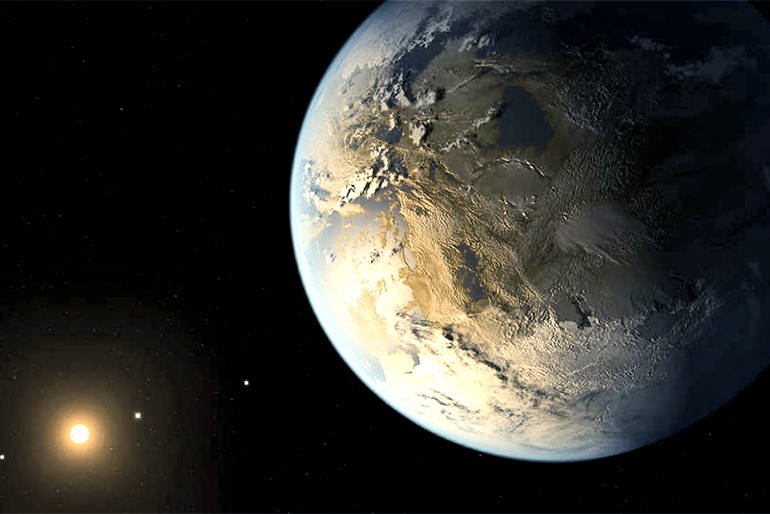 This finding, says Mendillo, suggests that scientists seeking extraterrestrial life could perhaps narrow their search area. PhD candidate Paul Dalba, who was working on exoplanet atmospheres with assistant professor of astronomy Philip Muirhead, joined the team to weigh in. “Dalba’s knowledge of star-exoplanet systems really helped,” Mendillo says. Currently, most scientists on this quest focus on M-class stars—the most abundant in the galaxy—and the planets circling them in the “habitable zone,” where water might exist. This makes sense, because life as we know it needs water. But scientists don’t know exactly how much water a planet needs to support life. Of course, this assumes that “life” is at least somewhat analogous to life on Earth, which requires not only water and oxygen, but also a certain temperature range, probably a magnetic field, and other factors. There’s one other catch, at least for now: scientists don’t have the tools to detect an ionosphere on any exoplanet—yet. Mendillo hopes his team’s work makes a case for further research, development, and exploration in this area. The researchers report their findings in the journal Nature Astronomy.